Lama Jampa Thaye visited India for 10 days in May to see His Holiness Sakya Trizin. Lama Jampa requested and received the major two day initiations of Sanjay Menla and Manjushri Arapatsana, both from the Collection of Tantras. 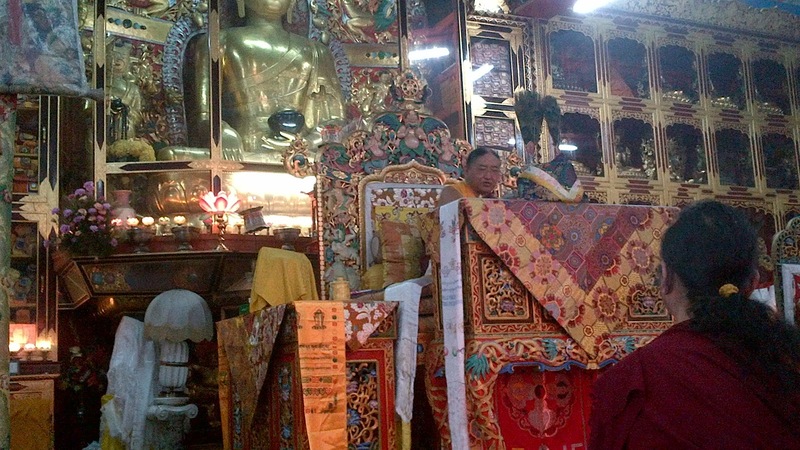 His Holiness gave these initiations in Sakya Centre itself, so as usual this provided the opportunity for monks, nuns and lay people to attend. In fact, at the initiation of Manjushri Arapatsana around 1000 people attended as the local Tibetan dharma school brought all its children to the initiation. His Holiness also gave some private teaching in the Phodrang for two days. In attendance at these private teachings, as well as Lama Jampa, were the 3 dungseys from the Phuntsok Phodrang (Avikrita Rinpoche, Asanga Rinpoche and Abhaya Rinpoche) and the reincarnation of Tarik Rinpoche. His Eminence Ratna Vajra Rinpoche arrived back from Singapore in time for the initiation of Manjushri Arapatsana. 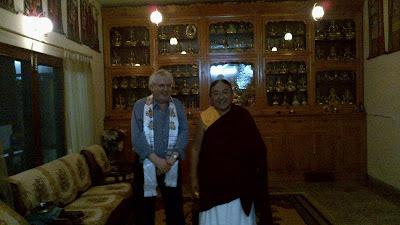 Lama Jampa was able to have many discussions with His Holiness, Gyalyum Kusho-la, H.E. Ratna Vajra Rinpoche and Dagmo Kalden-la about future plans. Lama Jampa also met a number of old friends, including Lama Lekshey as well as people from the Phodrang Lama Jampa has known for over 30 years. Kirsty Chakravarti invited Lama Jampa to Tegchog Samten Ling, a retreat place she has built approximately 3 miles from the Phodrang, where there are about nine monks from Gongkar Chode monastery in residence led by Lama Tenpay Gyamtso. 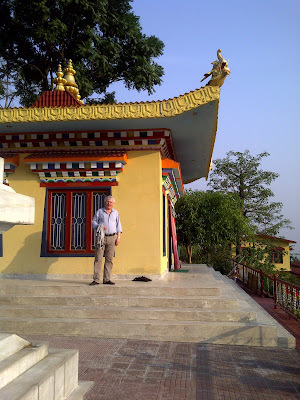 Lama Jampa and Dechen Dolma went to see this beautiful place which also has a beautiful stupa and shrines dedicated to the lamas and deities of the Sakya tradition, as well as Atisa and Guru Rinpoche. His Holiness is now leaving for His tour of the far East, beginning with Singapore, followed by Taiwan, the Philippines and Malaysia, ending back in India in late August.